A Heroic Battle is a type of encounter involving a story-based battle with specific Heroes. The Agent does not fight with the heroes in this combat, marking the first time that the Agent is not used in combat. Heroic Battles was introduced alongside Incursion on Story: Season 2 Chapter 1. 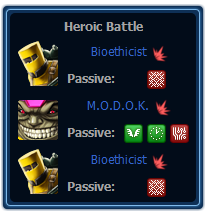 Heroic Battles can be found as an orange version of the Team page's Icon on the current Mission's Map. It costs 10 Energy to start a Heroic Battle. Players cannot initiate a Heroic Battle without having the required hero or heroes recruited. Heroic Battles are said to be challenging for low-level Heroes, as certain Hero Abilities help greatly in succeeding throughout the battle. If players are successful from a Heroic Battle, players have a chance to get a reward in the form of a roulette. The rewards range from random consumable Supplies, Isotope-8 and Command Points. There are also chances for specific Gear rewards ranging from Deploy Reward Gear to Limited Edition and Special Operations-exclusive Gear. Tips: Rouge must be level 10 atleast. Gambit can be even lv 2. No problem. 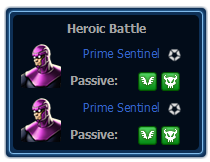 First concentrate on one sentinel first use southern comfort with Rouge then use Gambit's 2nd attack which gives exposed on the same target as hit before. Then in second turn use drain energy with Rouge on the enemy which you chose to kill. Kill him now with Rouge. Now use gambit's 2nd attack on 2nd sentinel and brawl him with Rouge they will die. Using this I didnt even get hit even once. Both Rouge and Gambit didnt even take a single hit point damage. Gambit dodged everything and Rouge got healed. Tips: Use 4x violent iso and 4x sturdy iso on Wolverine. Level 12 is recommended. First use 1st attack then second attack. He will escape now in 2nd wave. Use first attack then recharge with Wolverine. Now use second attack. He will escape again. First use first attack then second. 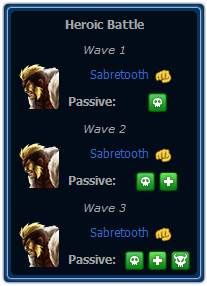 Sabretooth will die. Tips: Try to buy Nightcrawler's scrapper suit with which you can end the match in 2 minutes. Level 12 and 4x forceful 4x powerful isos on him go into match. First give weakened then triple threat. Match will be over eventually. Tips: Spiderwoman must be lv 10. 4x powerful and 2x forceful isos on her. First use fear feromones. Dont worry even if u have mental anguish. Blasters will heal you. Use venom blast on Modok. Till he dies only then activate the vengeance. Kill the rest . Tips: Hercules will get a new power for heroic battle which is "hit me". Tips: Cable must be equipped with 4x steady and 2x stalwart. If lv 12 use 4x stalwart. I am just telling for those who have them at lv 10 or ll. Deadpool must be equipped with 4 strong iso thats enough. First Iron Clad attacks and gets enraged 2x then use Deadpool's "FIRST ATTACK"
READ IT PROPERLY AGAIN WHAT I SAID ABOVE. It kills Iron Clad in 1 hit. Use Cable's time shift. Use body slide 2 times Vapor dies. Now get into overdrive and keep using first attack on X-ray. He dies in 2 attacks and kill Deadpool with 1 attack since you didnt use any health or defence on him he is useless. you outline in season 2 mission 6 (premium mission) is not correct. after ironclad attacks twice Cable is next. using cable's fist attack instantly kills ironclad. second wave use time shift once then body slide does not kill Vapor. then using OT you can kill X-ray in one shot. however, deadpool does not trigger loverboy protect at any time and you end up dead. Alvin you need hercules for the heroic battle as thor is the opponent. I cant fight the heroic boss in Season 2 Chapter 1 Mission 2. I play all the way through and Victor(Saber Tooth) never shows up wtf. why does in premium battles Cable and Deadpool just KILL THEMSELVES when attacked by IRONCLAD?? is that a bug or what??? 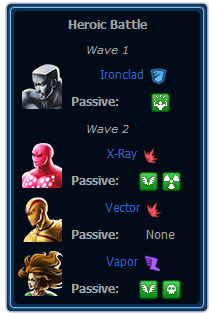 On Cable Deadpool battle, Ironclad doesn't go down with one hit, Vapor dodges a lot, and X-Ray's radiation exposure is ridiculous.